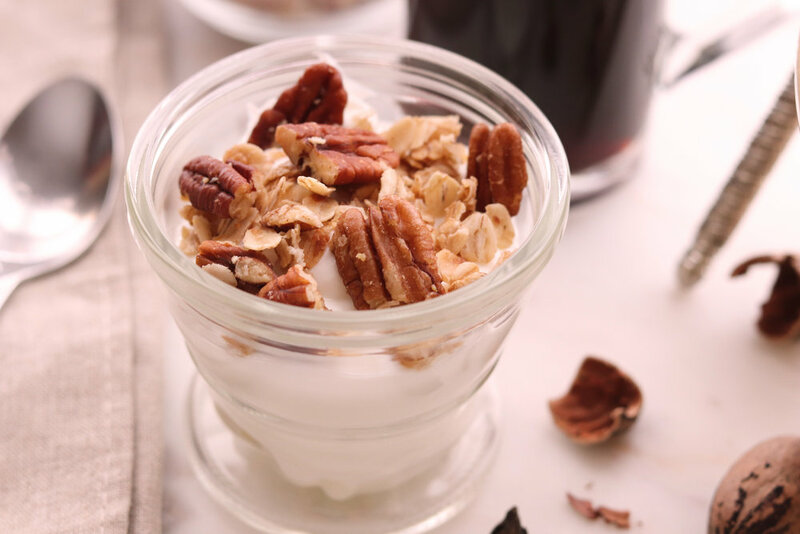 This small batch granola just has six ingredients! You can doctor it up with more add-ins but the simplicity of it appeals to me. Loosely adapted from a Rachael Ray recipe, I increased the pecans and used coconut oil in place of butter. While still a saturated fat, coconut oil contains medium-chain triglycerides (MCTs) which are broken down differently from other fats and less likely to be stored as fat. Personally, based on the research I've reviewed, I'm still not convinced that coconut oil is the "cure-all" that you see claims for, but, using in place of butter in recipes such as this adds an additional slightly sweet, nutty flavor. (It is also great as a hair and skin conditioner!). After coating the pecans in melted coconut oil and maple syrup, a splash of vanilla is added along with the oats. 5-10 minutes later the granola is toasty and ready to cool and eat! Adding the vanilla extract is a must - it really brings out that "pecan pie" flavor. Eat by the handful or sprinkle over yogurt (I like it on vanilla yogurt). In a large, nonstick skillet, melt the coconut oil over medium heat. Add the maple syrup and pecans. Cook, stirring frequently for 2-3 minutes. Add the vanilla and oats, stirring to coat with the pecan mixture. Cook, stirring frequently for 5-10 minutes or until golden brown. Transfer to a baking sheet and sprinkle with salt. Cool completely. Makes 6 one-half cup servings.